Everyone experiences impacted teeth differently. Many of us get impacted teeth during adolescence. For most people, they erupt with no fuss or muss, while others may have to deal with numerous problems associated with impacted wisdom teeth. If the dentist reveals an impacted tooth, it indicates that the tooth cannot push through the gum. There is the likelihood that other tooth is blocking its way. In most cases, it may occur at an angle, which is quite common for wisdom teeth. Existing molars at the back of the mouth block them so they erupt only partially. It is true that an impacted tooth can destroy another tooth. They are also more susceptible to decay or infection, as the impacted tooth is difficult to clean. Like baby’s teething, adults also experience pain and discomfort in this condition. 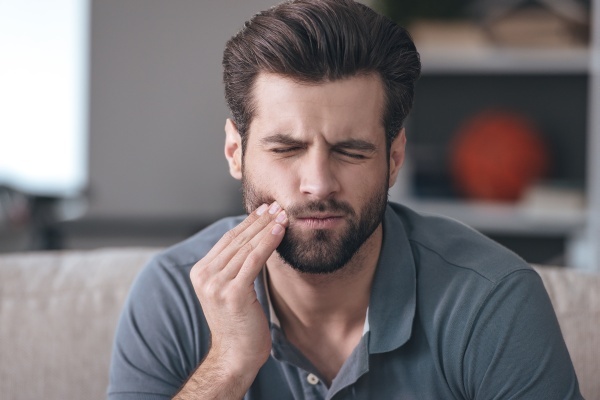 Several people can even develop swelling and redness of gums, pain in the temporomandibular joint (TMJ), swollen jaw and difficulties in eating and speaking. There is a series of debilitating symptoms associated with this condition, as well such as infection, which brings swelling, pain and fever. Therefore, it is highly likely that the patient will experience intense headaches when developing impacted teeth. Dental experts suggest that it would not be wrong to connect headaches with the development of the wisdom teeth. When they are coming in, you might need to adjust your bite to relieve discomfort occuring in the back of your mouth. This condition is common when impacted teeth have an infection and cause pain. In addition, when you adjust your jaw to bite, it put stress on your TMJ, which demands surrounding muscles to do extra work. This overworking leads to spasm and results in pain radiating through the neck, face and head, turning into an intense headache. You should focus on the right treatment to relieve headaches due to impacted teeth. There are OTC painkillers such as aspirin and NSAIDs available to reduce the intensity of pain in a short time span. However, dentists recommend to opt for an extensive solution and have impacted teeth removed completely. This is suggested because impacted teeth can cause constant headaches and are hard to clean. Therefore, instead of waiting for the development cavities, other dental problems or a headache, you should consider getting rid of impacted teeth once they begin to develop. The intensity of a headache seems impossible to tolerate. That is why removing the impacted teeth is considered an ultimate solution. Be sure to consult with a certified dentist to the get the right treatment in this context.